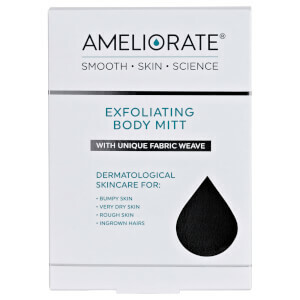 Cleanse and refine your skin with the AMELIORATE Wash and Mitt Duo. The nourishing body wash and exfoliating body mitt work in synergy to leave skin feeling soft and purified. Combining the brand’s unique LaH6 Skin Hydration Complex with a conditioning blend of omega fatty acids from Starflower and Camelina Oil, the award-winning, soap-free formula gently cleanses, softens and moisturises, leaving you with smooth, soft skin that feels refreshed. Crafted from an innovative fabric weave that is gentler than a synthetic or natural loofah, the cleansing glove works to efficiently sweep away dead skin cells and unblock hair follicles, revealing softer, smoother, healthier-looking skin and enhancing the efficacy of subsequent treatments. Body Wash: Squeeze into hand and lather over wet skin, rinsing well after use. Mitt: Use on dry skin before showering or bathing, using firm circular movements. Do not use on broken, infected, damaged or irritated skin. Not recommended for facial use. Care: Rinse regularly by hand or on a 30°C cycle and dry naturally. Due to fabric wear we recommend replacing the mitt at least every 6 months for optimum efficiency. Body Wash: Aqua/Water/Eau, PEG-7 Glyceryl Cocoate, Disodium Cocoamphodiacetate, Sodium Lauroyl Sarcosinate, Cocamidopropyl Betaine, Acrylates Copolymer, Sodium Chloride, Glycerin, Fragrance (Parfum), Phenoxyethanol, Glycol Distearate, Borago Officinalis (Starflower) Seed Oil, Camelina Sativa (Gold of Pleasure) Seed Oil, PEG-40 Hydrogenated Castor Oil, Trideceth-9, Laureth-4, Styrene/Acrylamide Copolymer, 1,2-Hexanediol, Caprylyl Glycol, Ethylhexylglycerin, Polyquaternium-10, Disodium EDTA, Sodium Hydroxide, Linalool, Citronellol, Hydrolyzed Milk Protein, Propylene Glycol, Citrus Aurantium Dulcis (Orange) Oil, Limonene, Coumarin, Juniperus Mexicana (Cedarwood) Oil, Lactic Acid, Alpha-Isomethyl Ionone, Citric Acid, Pelargonium Graveolens (Geranium) Oil, Pentylene Glycol, Serine, Sodium Lactate, Sorbitol, Urea, Benzoic Acid, Tocopherol, Allantoin.